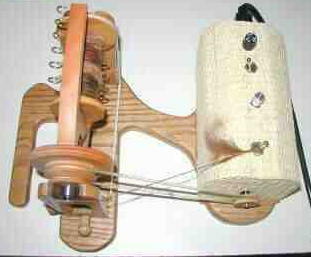 Here are some pictures I took of my new electric spinner, purchased from Wild Meadow Angoras at the Michigan Fiber Festival in August 2001. I am quite pleased with its performance so far. Lots of people have been interested in what it looks like. There are eight pictures here; we've shrunk them down as much as possible without sacrificing clarity, but expect the page to load slowly if you have a slow modem/connection. 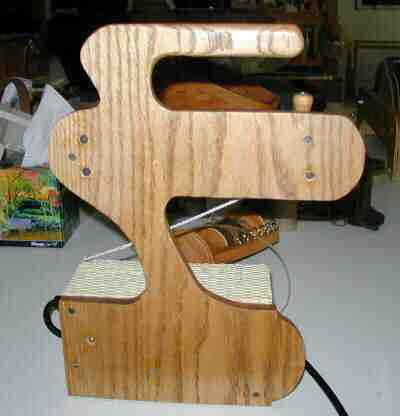 The maker of this espinner, Jerry Womack, now has a website with his own pictures, plus pricing information. Because his site is framed, you'll need to visit his home page, www.wildmeadowangora.com, to see the contact info, that won't display on the espinner page if you go there directly. If you have any questions, please address them to him, he's the expert! Specifications I was told: The motor is the one that runs fans in cars. At one point the maker told me it was 5,000 rpm, at another point he said he couldn't guarantee that. It's a DC motor. There's an on/off toggle switch on top, and a reverse switch. Speed is easily adjusted from very slow through super fast. 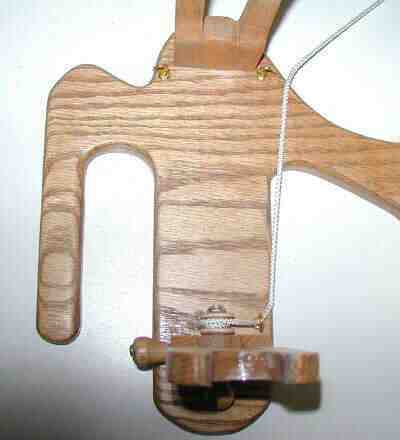 The flyer is the standard Ashford flyer, and comes with one bobbin (but no threading hook). 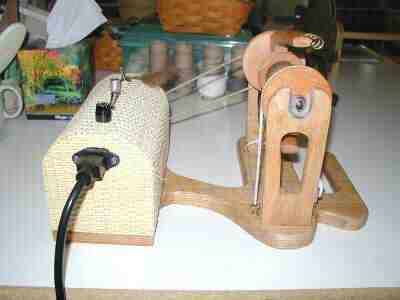 Overall I am very pleased with this electric spinner, having used it for about seven months as I write (March 2002). Update as of January 2008: I'm still happily using my espinner, though not the same one pictured here. Something went wrong with the first one not all that long after putting this page up, and Jerry exchanged it for a new one. It's about the same as my first epinner--maybe a little slower; it's hard to be sure of the speed with an espinner. Although I can keep up with the fastest speed when working with top quality roving, I rarely spin that fast. Plying is amazing--I can set the tension just so to pull the yarn in at the right rate to suit the amount of twist going in, and just sit and watch it do the plying almost by itself! Draw in is quite adjustable, my only complaint being that it has to be done with two hands, so I have to stop spinning. 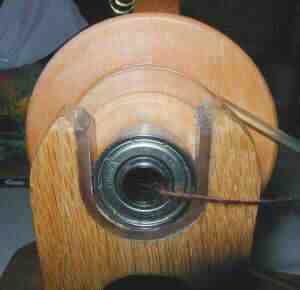 The motor is very quiet, offering only a hum that increases slightly in pitch as the speed is increased. There's a slight rattle as the yarn winds on when I spin long draw, but other than that, the spinner is extraordinarily quiet. I don't have to raise the volume of my music much at all. I highly recommend this spinner to anyone in the market for an electric spinner. If you have any comments or questions I can answer as a user, feel free to contact me and I will do my best to respond. If you want to contact the manufacturer, please email tignal@aye.net. Front of spinner. The motor, on the right, is completely covered by the cane. It should be pretty simple to speed the flyer even more by adjusting the drive band to wrap around the smallest whorl on the flyer. As manufactured, the drive band fits the middle whorl. 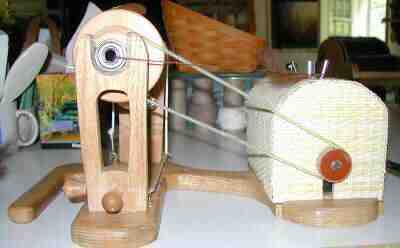 Note: Jerry provided me with a driveband for the new espinner that fits the smallest whorl. Top of spinner. The fuse is the black thing toward the back of the motor cover, the toggle below it is for reversing the motor, the round silver knob is the speed control, and the toggle at the bottom is the on/off, with my yarn wrapped around it. In this picture you can clearly see the tension knob pointing forward. Back of spinner. The electrical cord is grounded, and can be unplugged from the spinner, making it easier to move. The cord is a bit short (about 68"), but can easily be replaced if needed. Also, Jerry said it would be easy to buy an adapter at Radio Shack to allow the espinner to be plugged into a car cigarette lighter. Bottom of spinner. It's all solid wood, with some sort of finish, but I didn't think to ask what type. The part at the top forms a very nice handle. 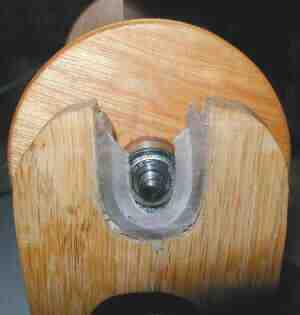 Front bearing and orifice. The bearing fits snugly in the 'cradle' yet is easy to pull up with the flyer if the flyer is removed from the base. Back bearing. A little less tidy in appearance. It has an extra flange to prevent the back bearing from flying off the back of the base. Update in 2008: The bearing on the new espinner doesn't have the flange (which had a tendency to come unglued, anyway) and does just fine without. Scotch tension knobs. A rather inconvenient arrangement, you have to use both hands to adjust the tension. 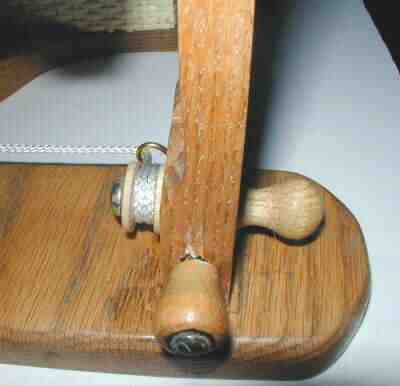 The knob pointing at the viewer is loosened, which allows the knob to the right (which sticks out at the front of the flyer) to tighten or loosen the tension on the nylon brake band. Then the first knob is tightened so the tension knob won't slip in use. Top view of tension knobs. You can see the cup hooks which guide the brake band (screwed into the base, near the maidens). This band has performed very well at high speeds. There's very little sign of wear.